to allow a full investigation, upset me. will sit on the bench of the court I love so much upsets me tremendously. I feel like the country I love is falling apart. It is not a partisan thing but a crazy power money run amok thing. Not all drinkers are alcoholics. Not all alcoholics are abusive. from his good buddies in college and beyond. 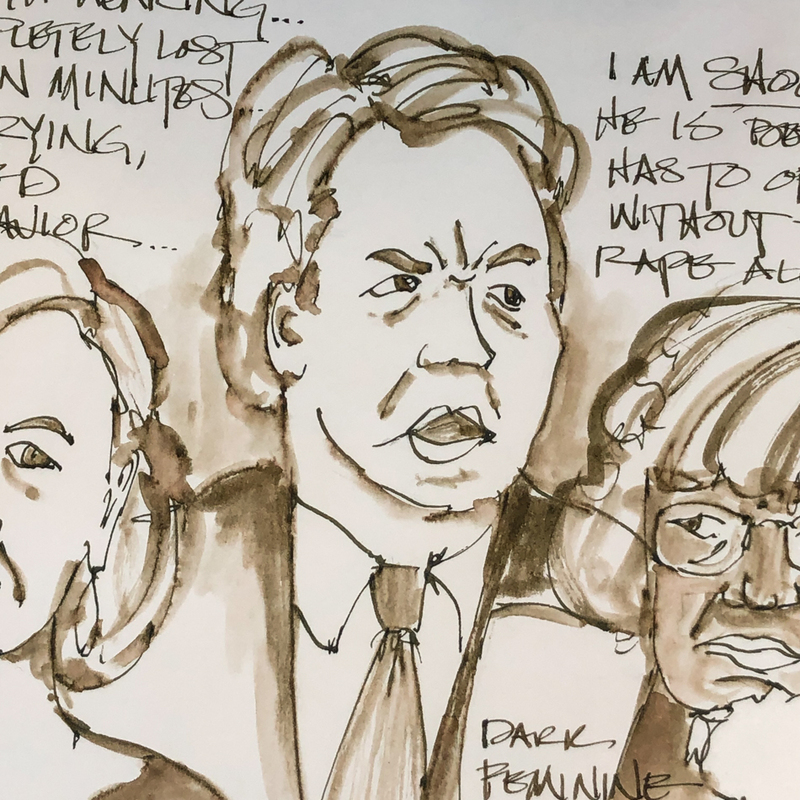 His unhinged behavior within minutes at the hearings…. Robert Oster Motor oil in the Pilot Metropolitan. a big dollop hit the female prosecutors face. So now she is a shadowy feminine figure! Da Vinci Alizarin Crimson watercolor. This entry was posted in art journal, challenge, creativity, drawing, ink painting, journal, pen & ink, process, sketchbook and tagged #Hahnemühle, #HahnemühleNostalgie, #inkpainting, #inktober, #inktober2018, #kavanaughhearings, #middleofthenight, #motoroil, #nostalgiejournal, #robertosterink, art journal, Nostalgie Sketch Book Journal, Pilot Metropolitan Fountain Pen. Bookmark the permalink. I too thought of drawing this and may yet do so. It was powerful, the stuff of theatre. Yes. I don’t think it is going to change this round and I fear he will be confirmed… it makes a mockery of the court.